You are considering rotator cuff surgery. You are concerned about your rotator cuff healing and recovery. Many rotator cuff tears will heal after surgery. Some tears, however, may not heal. Rotator cuff healing is a very complex topic. Why? Because the rotator cuff is a very complex structure, and the shoulder is a tough environment for healing to occur. Healing of your rotator cuff tear will be dependent on many different variables. This post will cover healing of your rotator cuff tear. We will discuss the relevant information we use to determine if your tear has a good chance of healing after rotator cuff surgery. Many of you will develop a rotator cuff tear due to severe tendinosis (degeneration) of your rotator cuff. That is simply because the rotator cuff tendon can wear out over time. Although far less common, some of you will tear your rotator cuff after a fall or injury. how long your tear has been present. Many of you have already tried injections, anti-inflammatories , an ice compression wrap and physical therapy. For some of you that worked, for others a rotator cuff repair surgery becomes an option. Let’s review the current research about rotator cuff healing. The rotator cuff are a group of four muscles that surround the shoulder. They come together in a “cuff” which surrounds the top of your humerus. The rotator cuff of a 50 year old does not look like the rotator cuff of a 20 something. Think of your favorite pair of blue jeans — the denim around the knee looks very different then it did when your purchased them 15 years ago. The rotator cuff can wear out too. If it wears out enough, a tear or defect can result. Do all rotator cuff tears require surgery? No. 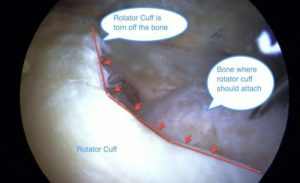 Can the rotator cuff tear become larger without surgery? Yes. Can the rotator cuff heal without surgery? No. Do all rotator cuff tears heal? Short answer, No. There is also a lot of controversy about what we as surgeons should do both during and after surgery to try and give your rotator cuff tear a better chance at healing. Below are a set of observations recently published in one of our major journals. They are meant to show whether or not many of the tips/tricks we try at the time of your rotator cuff surgery will improve the chance of healing. ➤ Several studies have noted that increasing age is a significant risk factor for diminished rotator cuff healing. This may be because our rotator cuff tissue is wearing out. Biomechanical studies have suggested the reason for this may be an inferior healing environment in older patients. Healing is complex. It takes many cells, and chemicals or proteins to help heal a tendon. As we age, the chance creating a healing environment in the shoulder diminishes. ➤ Larger tears and fatty infiltration or atrophy negatively affect rotator cuff healing. This post will explain why the size of the rotator cuff tear matters. ➤ There is conflicting evidence to support postoperative rehabilitation protocols using early motion over immobilization following rotator cuff repair. via The Journal of Bone & Joint Surgery | Factors Affecting Rotator Cuff Healing. So… what does that mean to you ? – IF you are over 60, your rotator cuff tissue is wearing out. While we have very strong sutures and very strong ways to attach your rotator cuff to the bone… that does NOT address the underlying reason why your rotator cuff might not heal. Your rotator cuff repair might fail because your tissue is simply too worn out. Again.. imagine closing a big hole in the front of your jeans. The strength of the thread doesn’t matter , because the fabric is soft, and falling apart. Only recently have shoulder surgeons started to use a biological patch to try an reverse the degenerative changes in the tissue. If all goes well, this patch could theoretically decrease the risk of re-tearing your rotator cuff. Ask your surgeon if they plan on using this. Many orthopedic companies are now starting to offer various type of patches. These patches might increase the chance that a rotator cuff will heal. Time will tell as the research into this are continues. We in the in Orthopedic community need to change our focus to the “biology” of healing. For far too long we focused on using stronger sutures, or stronger bone anchors. Instead, we now need to focus on technologies that could reverse the tendinosis or degeneration and improve the healing environment within your shoulder. – A bone spur in your shoulder is NOT the reason why you should consider surgery. There have been so many research studies showing that removal of the bone spur does not improve shoulder pain or decrease the risk of developing a new rotator cuff tear. – Large tears do not heal as well as smaller tears. Some small tears will become larger with time. Sometimes it’s best to consider surgery sooner rather than later to improve your chance that the rotator cuff will heal. Perhaps THE MOST important paper to come out in the realm of rotator cuff repairs showed that your risk of your rotator cuff tear not healing or tearing again extends beyond 6 months after surgery. These researchers showed that if your therapy is too aggressive or if you return to your normal activities too fast your rotator cuff repair might fail. That would be a shame to put in all that effort and endure all the pain only to have your rotator cuff repair fail. If your PT or surgeon says you can return to normal activities before 6 months they’re simply wrong. Protect that shoulder of yours, your first repair is your best chance at a successful rotator cuff repair. I hope this little lesson in rotator cuff healing was helpful. If you still have other questions about rotator cuff tears there are many, many more posts on this site to guide you. Click HERE to learn 5 more key facts about rotator cuff tears. Further updated thoughts on why a rotator cuff tear might not heal can be found here. There are Amazon affiliate links on this page. I am 44 yrs old and I swam every day for over an hour for several months. A mild pain became more severe until I could not rotate my right arm without a lot of pain. I received a shot (cortisone?) and in a couple of weeks the pain “cleared”. However, a few months have passed, and my right arm still hurts when I rotate it. I want to get back to swimming and hope to progress competitively in Masters Swimming. Obviously I can not offer specific advice or diagnoses… however, given your complaints it is entirely possible that your rotator cuff is the source of your pain. Most rotator cuff related problems respond to physical therapy. I would have a shoulder doc take a look at your shoulder so you can be properly diagnosed … then he/she can recommend a treatment program catered to your needs. I had rotator cuff repair in sept 2013 and have experienced more pain after surgery than I ever did before surgery. This was due to a work comp injury. Had two anchors placed for a partial tear. Recently, I was kicked in the same shoulder by a combative patient and have been experiencing even more pain. The surgeon ordered an MRI and the findings showed a full thickness supraspinatus tear, along with tendinitis and bursitis. The surgeon said he disagrees with the full thickness tear because of fluid build up. I would think that a radiologist would take that into consideration in his report before diagnosing a tear. I am beyond frustrated because I cannot do my job or even daily activities without severe pain. How common is it for a radiologists findings to be ignored? I feel like I am just getting put on the back burner due to it being a work comp case. Hi Heather … sounds like a good time for a second opinion. Hi doc, I am 21 and have been through a shoulder surgery due to partial tear to my rotator and labrum and it has been about 2 years since the surgery and the first year it totally was not the same throwing a baseball and Dont know if it will ever be again but last week I threw and my arm had some suprising life to it I have been working out and eating better so could this possibly be the time my arm has been waiting for? And also chewing tobacco, will that hinder my recovery to a point that could behold me from possibly throwing 90 mph again? Any chance I come back stronger? It’s possible chad … throwers with partial cuff tears due to instability (loose ligaments or labral tears) can respond quite well to a full body rehab program. Don’t forget your core work, abs and gluteal muscles.Then working on pliometrics for the cuff also helps. I am 59 years old and had rotator cuff surgery 4 months ago, I’m at about 25% range of motion, and still in pain when I move. Is this normal? I do not under any circumstances want to have this surgery over. This process puts a new meaning to pain. I have to return to work next week and I hope this will eventually heal. Are there any type of bandages or braces out there to help relieve some of the pain and possibly regain movement and motion? I’m a 23 year old male and relatively new to the gym (I’ve been going for about 4 months or so). After doing some chest related dumbbell exercises I went over to a chest press machine. Before I did any lifting I pushed my shoulder back to grab the handles and heard a pop. Shortly after I had a little bit of pain and slight weakness. Five days later I still have some minor weakness and some pain. My shoulder also has been clicking occassionally. I’ve started PT on my own and that appears to help. Does a loud pop necessarily mean that the rotator cuff is torn, even if it is followed with some pain and weakness? I’m a little concerned since this has lingered for a few days. I’ve also been told that full rotator cuff tears are somewhar uncommon for people of my age. You are correct… rotator cuff tears at your age are very rare. No, a pop does not imply that a tendon has torn. If the pain persists see your Orthopedist. You state that a bone spur is not a reason to get surgery. Five years ago I had a bone spur in my left shoulder that caused pain and limited mobility. I had surgery and my shoulder still feels great today. However, I now have the same pain in my right shoulder. How do you suggest I resolve this without surgery? Will the bone spur go away by itself? Hi David … For a long time this was a huge debate among shoulder surgeons. It is now very well recognized that the spur is not the likely source of pain, nor the cause of rotator cuff tears. I’m glad you did well after your surgery. When we used to go in to shoulders and take down those spurs we also had to remove the inflamed bursa to see the spur, and at the same time we cleaned up and fraying of the rotator cuff, etc. So .. in the end, you don’t actually know if it was the removal of the spur, the clearing of the bursa or cleaning up of the rotator cuff. Our latest series of posts is focusing on patients like you… the most common cause of shoulder pain after 30 is a process called rotator cuff tendinosis, with or without a secondary bursitis. Your doc helped you out the first time.. I hope he/she is still around to assist you now. Unfortunately, without examining you I can not tell you what might be bothering you. i) Does surgery is the only option, cant it can be healed with medicine or any other therapy. ii) The age of my mother is 68 and what are the chances for recovery in this age. what else option can be explore in place of surgery. I am very impressed by your article, I have rotator cuff calcific tendinopathy and focal subdeitoid bursists. I had an injection a week ago by a orthopedist. Now I still feel some pain and the orthopedist ask me go back for another ject. on Monday that is tomorrow. I am very worried. Can I make a appointment to see yours soon as possible? What is your best suggestion? You can certainly make an appt to come in and see me. Feel free to call us at 914-789-2735. There is no rush… this is not an emergency situation. Here’s my situation and quick question on your suggestions and whether I should have surgery or not. I am 25 and dislocated my shoulder snowboarding it was out of socket for about 1 hour before getting it reduced in hospital. The injury left me with a partial thickness supraspinatus tear but no other damage and my labrum was intact. I started physiotherapy immediately for the last two weeks and am in week three now. I stopped wearing the sling three days ago. My range of motion has gotten a lot better but am still missing the external rotation. I have also started seeing a chiropractor who is giving me active release technique treatments as well as acupuncture. My pain is very little but do not have all my strength yet. I work full time as a firefighter and really want to make a full recovery without surgery how long am I looking at to heal this type of injury. Driving is an issue, and you can not be on pain medications. I would review this with your surgeon to get their personal thoughts. Hi I have a question. I’m a 39yr old female. About 5years ago I had an mri done which showed a rotator cuff tear. Nothing was ever done about it. Today I’m having so much pain it hurts to take a deep breath,mo e my head/neck, & or any movement of my right arm/shoulder. I’m in tearS even after taking g heavy pain meds that I take for my fused back. What needs to be done? Please help me this is such a horrible pain. On 2/17/15, my surgeon performed arthroscopic surgery of the right shoulder for a full thickness supraspinatus tear. I was in a sling for 6 weeks and attended PT 3x/week for 17 weeks. The last followup with the surgeon was very encouraging. I have almost complete ROM with some good strength building up. Yesterday, 6/26/15, I took a small, patio level dive in the pool and in the middle of completing my initial underwater stroke, I felt a sudden stretching pain in the repair area that frightened me. I woke up this morning with some stiffness and feel some light to moderate pain in certain arm positions (sometimes even just leaning over). It’s difficult to describe the sensation, but I would say it’s sort of like a tangle of tendons/muscles that dissipates as I engage the area. I’ve been extremely paranoid about re-injuring the tendon and as such I’ve been very cautious with it. The dive was calculated and controlled (which I’ve done several times in the past 2 weeks with no issues). I’m so fearful that I may have torn it again. I realize you can’t provide a diagnosis. But I’d love to know what “normal sensations” at this stage of my recovery I should expect? Before the incident, I felt practically no pain/discomfort. Since the incident, it’s sort of sore and stiff. Thank you Dr. Luks. That was interesting considering the time span between 20-24 weeks for re-injury to occur happens to coincide with my shoulder feeling relatively good and strong. I could see how feeling much better at this point one may take certain things for granted and start doing things that would otherwise be inadvisable. My shoulder experience in the pool makes me feel like I regressed to the point in PT where I went from passive ROM to active. Before this incident, I also stopped going to PT for about 2 weeks precisely because I was feeling so much better. I can’t help but wonder if that 2 week period actually weakened my gains. I presented to the doctor that my left arm could not be raised sideways above the horizontal and if stretched out in front was about 25/35cm shorter than the right, if I raised my arms up the left curved out and the right was straight. It has only become evident in the last 6 months of general gym work that I noticed these disparities. I am not sure at my age 62 that surgery to reconnect the tendon is an option. I have had Frozen Shoulder in this arm (took 3 years to get over) before but apart from some weakness in certain resistance exercises no other issues. The interesting thing is that I have no knowledge of a fall or such that would explain this injury – I ma right right handed and non-diabetic and I have experienced 90% tear in right shoulder with rotator cuff tear of infraspinatus. So i know the sort of pain. Could I have been carrying this injury since/after birth – my earliest childhood recollections go back to age 3. I’m a 57 year old female. I developed joint problems after chemo for non-hodgkins lymphoma, Leviquin, and a radiated drug called Bexxar. I have been in remission for five years. I exercise a lot, am very active and play the violin. My right shoulder is limited in movement and causes me a lot of pain, even at night. I’ve tried resting it, have had two steroid shots and an MRI. My doctor says I have bursitis, a minor tear and a bone spur. He is not pushing surgery but I have tried the other treatment options, only to have it worsen. Is this a fix it or live with it situation? I would appreciate any advise. Thank you. Sounds like a frozen shoulder ??? Which is simply a shoulder that has less movement than normal. If PT is not effective, there are surgical alternatives — that do not include bone spur removal. I would consider another opinion. I met with my orthopedist today for a rotator cuff partial thickness tear and degenerative changes. I am a wheelchair user since 2013 and play competitive wheelchair tennis, so he decided it would be in my best interest to do an arthroscopy to access/fix the tear, remove the spur and access the level of arthritis. I cannot find anything online regarding recovery of rotator cuff tears and are a complete wheelchair user. I would like to know the level of care would be required. Are there supports/equipment available to provide some level of continued independence? I realize increased care would be required, but how much. Also, do you know where I may be able to locate information on shoulder surgery as a Parapeligic ? Any information would be helpful. Tread very lightly when it comes to shoulder surgery when you are confined to a wheelchair. Surgery is the last option we consider for degenerative rotator cuff disease and partial tears. How long will I be off work. I have an office job. Thank you. My surgeon first said at least 6 weeks, so I put the surgery off. I saw him this week to schedule surgery and he said 2-3 weeks. I also have several cysts from chronic inflammation. I injured my arm about 15 years ago and have dealt with the pain long enough. It just seems like I have a lot of issues with my shoulder, so recovery may take longer. I am a 54 year old very active female (yoga/mountain biker) I have a 60% tear of the supraspinatus muscle. My doc is recommending 6 weeks of PT….my question is….what is the likelihood of this healing WITHOUT surgery? I have been using a tens unit and anti-inflamatories on my own for the past month. The pain has a good chance of subsiding… the tear has little chance of healing. If PT doesn’t help then you may want to explore other options. Does a rotator cuff tear cause upper arm muscle spams? He does sound like he’s correct. I am 59 years old I tore my rotator cuff last May 11,2015 at firs the pain was extremely bad but starting this month I feel better but still it still hurt if I reach my back, when I’m lying down and push myself to position.impression after MRI. 1.AC joint degenerative and type 3 carom ion resulting in impingement. 2.Distal rotator cuff tendinoses with small intrasubtance tear of supraspinatus tendon and questionable insertion tear. 3.interval edema suggestive of tear. 4.Abnormal superior labrum signal suspicious of tear. 5 .subacromial and subdetoid bursitis. I am still active and work fulltime,constantly pick up 6lbs that will total to 800lbs during my work. will really appreciate for the best option of treatment that you will advice.Thank you so much. You have non-surgical options too with a reading like that… consider a second opinion and understand that degenerative tendinosis will worsen over time — no matter what you do. It is not uncommon for it to take a long time to feel better. But keep in mind that re-tears can occur up to 6-7 months after surgery. It takes a lot longer for tears to heal than most people think. So don’t push it too hard. I have after a year of painful suffering been told I have a rotator cuff injury and finally my doctors have referred me to an ortho specialist – my concern is I also have a large lump on my neck which my GP thinks is part of the rotator cuff injury. Can you tell me if this is something you have ever come across before or should I be looking for a second opinion. Thanks in advance. After 4 months of shoulder pain I got an MRI done that shows a full thickness tear of the rotator cuff. I’m 62 and don’t remember any injury. The one exercise I like , tennis, seems to aggravate the shoulder even though I don’t use my left arm much. I’ve developed one arm shots to replace my former 2 arm shots. I’d rather not do surgery so I’m wondering if you have an opinion on the use of stem cells. Supposedly this therapy works pretty well with partial tears, but I don’t know about full tears. The literature has not show it to be effective. But therapy might be for a small tear. Hello Dr. Luks, generally, after a full thickness tear repair, do you let the patient stop using the arm sling? Is there a procedure you use? IE can be off at home and during the first phase of PT, totally done with it by? Th time in a sling can vary… but it is usually 4-6 weeks — and I do not allow people to remove it often. the risk of failure is too high if you move too much. I have many patients fly in and out within a week to 10 days after surgery. They return 5-6 weeks after surgery for another evaluation. I am a young archer, at the beginning of the season. In the next few months i have nationals in a few several large cometitions at national and international level. I just injured my rotator cuff, however. I obviously am not able to take a month or two off training to recover. Is there any quick fix or at least something to keep most of the pain at bay until the end of the season? I have tried stretches and exercises but they dont make much difference. Some details: while shooting, i have to rotate my shoulder under 46 pounds of pressure, then hold it up for about 7 seconds, very still. No easy answer here Matt… like marathoners who want to compete in a month who have a severe injury. Hopefully your stretches and rotator cuff exercises help over the next month — they are generally not a quick fix.